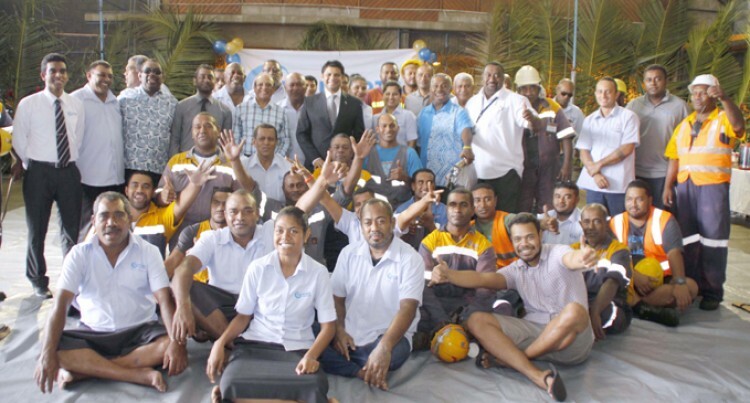 Two hundred and seventy staff of Fiji Ports Terminal Limited will be sharing a total of $284, 000 as part of their second bonus payout for 2015. This was yesterday announced by Attorney-General and Minister for Economy Aiyaz Sayed-Khaiyum in Suva. While thanking the workers for their tremendous efforts and contribution towards the company, Mr Sayed-Khaiyum highlighted the need for increased productivity. He added that if the productivity level of our ports increased, the company would make enough money to buy better equipment making workers lives easier. “When you have better equipment you have better productivity. Not only will this profit increase but you’ll have more and more ships coming into Fiji,” he said. Mr Sayed- Khaiyum said same time Fiji would grow as a transhipment hub for the region. Mr Sayed-Khaiyum also thanked the FPTL board for their vision, generosity and transparency. “I would like to thank the board for the second bonus pay out. I would like to thank the CEO and the management for their vision,” he said. FPTL chairman Hasmukh Patel said the second bonus payout was a testimony of their commitment towards their work. “The Bonus payment for 2015 is an addition to the already paid $283, 000 performance payout in September 2016,” Mr Patel said. He also said there was a need to further enhance port productivity in moving Fiji towards the achievements of transforming into a regional logistic hub.